From the Gospel of Matthew, 27:62-66, Douay-Rheims: And the next day…the chief priests and the Pharisees came together to Pilate, saying: Sir, we have remembered, that that seducer said, while he was yet alive: After three days I will rise again. Command therefore the sepulchre to be guarded until the third day: lest perhaps his disciples come and steal him away, and say to the people: He is risen from the dead; and the last error shall be worse than the first. Pilate saith to them: you have a guard; go, guard it as you know. And they departing, made the sepulchre sure, sealing the stone, and setting guards. Of the four Evangelists, Matthew alone records the above conversation among Pilate, the chief priests and the Pharisees, the latter two being concerned that Christ would emerge from the tomb to continue stirring up the people. To which Pilate responded, well, then guard the tomb. He had already washed his hands of the matter, yet here it is again. So, just guard the tomb, and (reading between the lines) leave me out of it. This episode also appears in the apocryphal gospel of Peter, where the story follows the same thread. 1. 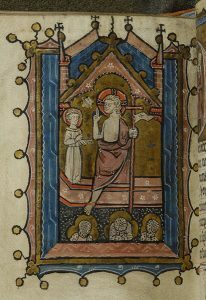 Miscellany, 1280-1299, Cambridge, St. John’s College, MS K.21. The upper image shows two high priests or Pharisees before Pilate expressing their concern that the tomb be guarded. 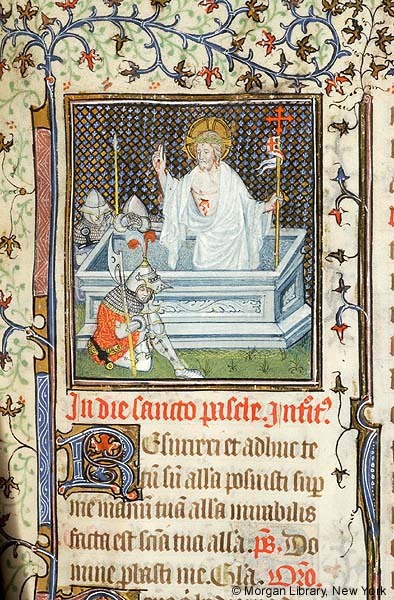 Below, Christ stands in a sarcophagus; three soldiers sit in front of it. The text in the left column relates the story. 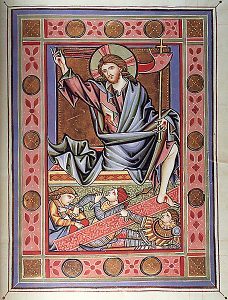 Christ’s resurrection appears in the Index of Christian Art 500+ times in multiple media; the order to set the guard is represented only sixteen times. 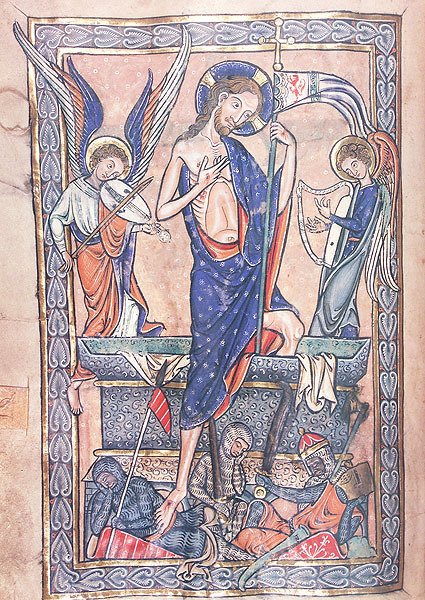 The Cambridge Miscellany (Fig. 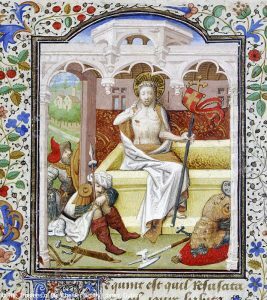 1) presents the thread of the story well, with the text in the left column, and in the right, a miniature with two figures petitioning Pilate, above a resurrection image with soldiers. 2. Châlons Missal, c. 1400, New York, Morgan Library, MS M.331, fol. 130r. Three soldiers surround a sarcophagus, one leaning on the back side of the tomb. 3. Hours of Anne of France, 1470-1480, New York, Morgan Library, MS M.677, fol. 200v. Many recumbent bodies wearing gold armor surround the tomb. The number of soldiers present varies. Two, three or four are common (Fig. 2); examples exist with what appear to be small armies (Fig. 3). 4. 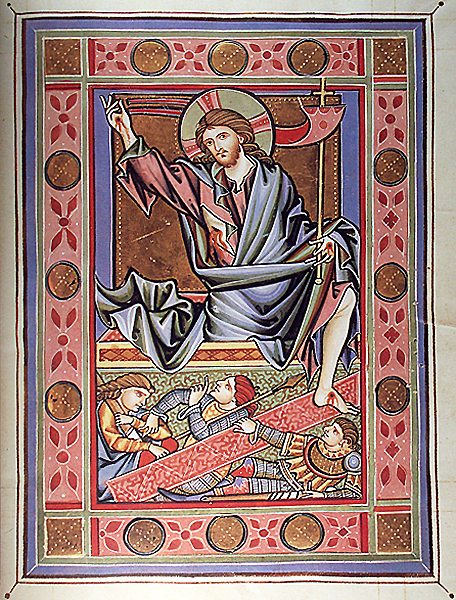 Rheinau Psalter, c. 1250 Zurich, Zentralbibliothek MS Rheinau 167, fol. 107r. Three soldiers, with eyes open, two looking up at Christ, one pointing toward him. 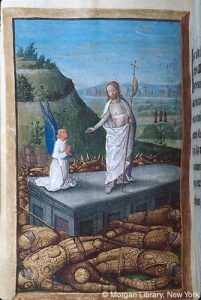 Largely the soldiers are sleeping, but some are awake, looking up toward the risen Christ, sometimes shielding their eyes (Fig. 4). 5. 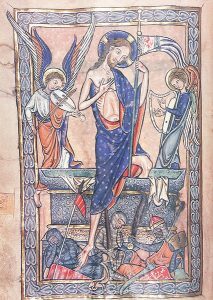 Coëytivy Hours, 1440-1449, Dublin, Chester Beatty Library MS W.82, fol. 342v. A soldier with his back turned rests comfortably on a red bolster with a gold tassel. They wear chain mail or armor that is medieval, not Roman, which they would likely have been. Many are accompanied by weapons and shields, sometimes decorated with quasi-heraldic ornament. Some have creature comforts, such as a bolster to sit on, or a mattress to lie on (Fig. 5). 6. Antiphonary Fragment, c. 1300, Philadelphia Free Library MS Lewis EM 44.15. 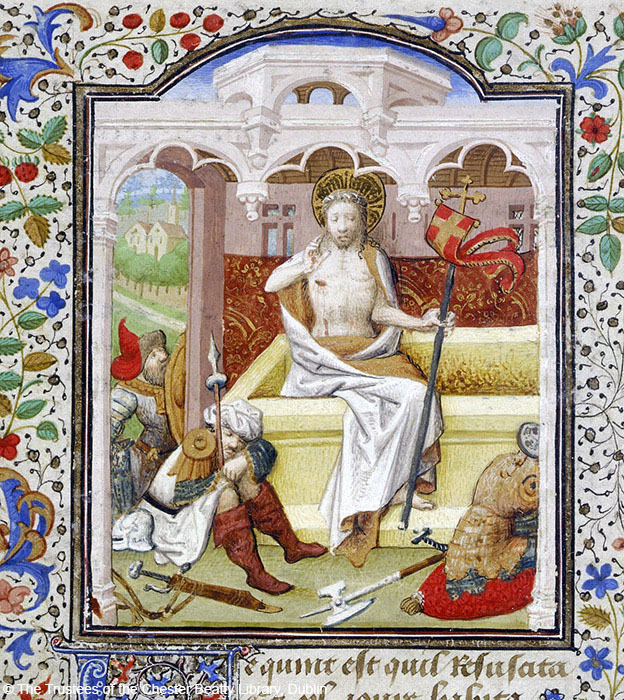 Christ steps from the tomb onto the neck of a sleeping soldier. They pass the night at the tomb; they sleep even though Christ occasionally steps on them while climbing out of the tomb (Figs. 6 and 7); and they are still asleep when the three Marys, or Holy Women, arrive the next morning carrying ointment jars and sometimes censers. 7. 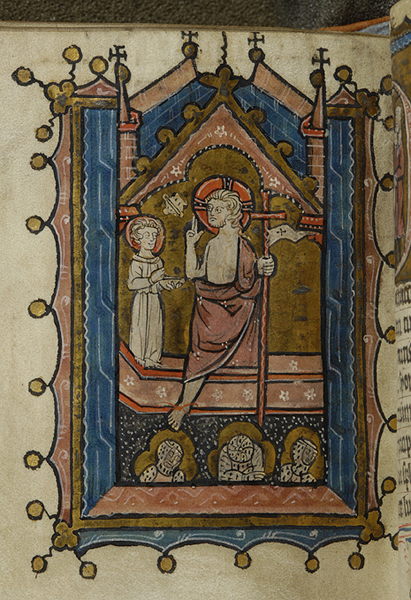 Missal of Henry of Chichester, c. 1250, Manchester, John Rylands University Library, MS lat. 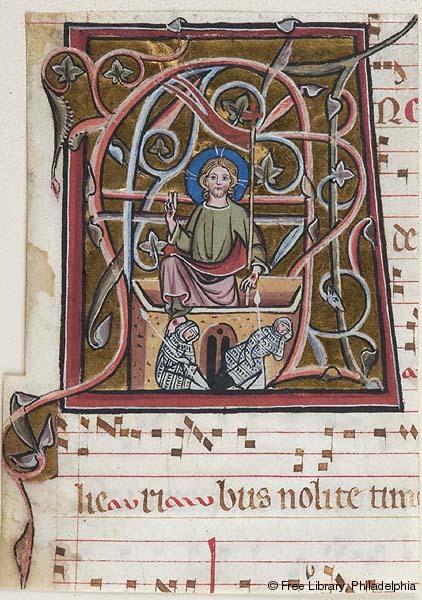 24, fol. 152v. Christ steps on one of two dark-skinned soldiers asleep before the tomb. Signs of “otherness” appear: a distorted face with a pig-like snout for a nose; knotted headdresses; curved swords or scimitars; dark skin (Fig. 7). The tomb itself may be a plain sarcophagus; or it may look more like a medieval shrine, with openings in the base. 8. Psalter, c. 1290, New York, Morgan Library, MS M.34, fol. 187v. Each of three soldiers is tucked into an opening below the tomb. Instead of pilgrims trying to get closer to the relics inside, the soldiers use those openings for cozy sleeping spaces (Fig. 8).